Heat oven to 425°F. Spray 13x9-inch pan with nonstick cooking spray. In shallow bowl, combine crushed stuffing, seasoned salt and thyme; mix well. In another shallow bowl, combine milk and egg; beat well. Dip pork chops in egg mixture; coat well with crumb mixture. Place in sprayed pan. Bake at 425°F. for 30 to 35 minutes or until golden brown and no longer pink in center. In small bowl, combine applesauce and cranberry sauce; mix well. 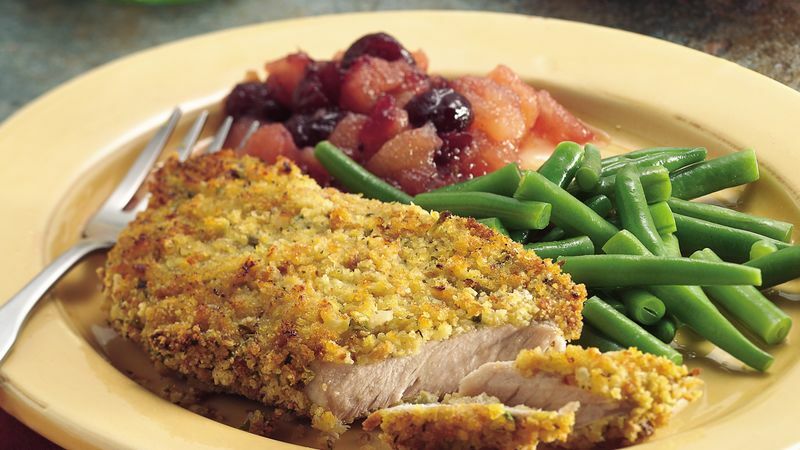 Serve cranberry applesauce with pork chops.